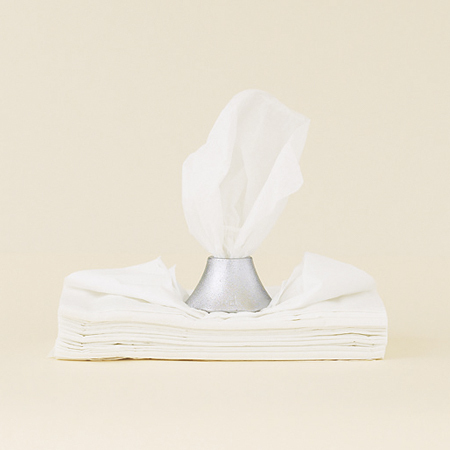 A tissue paper has a characteristic where "it is folded so that when a piece is taken out, the next one follows so that it can be easily taken out". "Kazan" is a product that utilizes this characteristic; it is put on top of a pile of tissues like a paper weight instead of the usual box, and tissues can be drawn from the hole on the top. Regularly, when buying tissue papers, one often chooses the packaging that fits his/her likings, but when one is given a box of tissue as a prize and such, there are many cases where the design of the box and the interior of the house does not go well together. Even if one finds something that fits the interior, the box will eventually be destroyed and the interior coordination will be spoiled. However, the connection between "folded tissue papers" and "boxes" cannot be broken, and the packages are becoming standardized. "Kazan" solves these problems by proposing a new way of using tissue papers and a freedom of the users. Once the box is broken, simply set it on top of the remaining pile. One can even use it from the start and use a little bit at a time. "Kazan", where the extruding paper closely resembles an "eruption of a volcano", gives life a humor and cheerfulness with its simple form. It can even be said that by escaping the concept of design that tends to lean towards functionality, this is a product that brings "harmony" to homes and families.